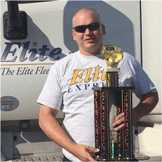 Elite Express hires and trains its own drivers. Specialize in LTL "Load to Deliver" Service to 48 States. LTL and TL Temp Control Service to 48 States. Celebrating over 15 Years of Elite Express!!! FIRST TIME SHIPPER, CLICK HERE! !